Description: Cajeput is a small tree with a tolerably erect but crooked trunk; a soft, thick, spongy, whitish, ash-colored bark; and scattered branches, with the slender twigs often drooping as completely as in the weeping willow (Salix Babylonica). The leaves are alternate, most frequently vertical, short-stalked, narrow- lanceolate, while young, sericeous, sometimes slightly falcate, from 3 to 5 inches long, and from 1/2 to 3/4 of an inch broad; and very aromatic when bruised. Common Uses: The chemical constituents of Cajeput Essential Oil have antiseptic and anti-microbial properties, which make it used chiefly as a local application for skin ailments. Other properties include analgesic, anti-neuralgic, antispasmodic, and insecticidal assets. 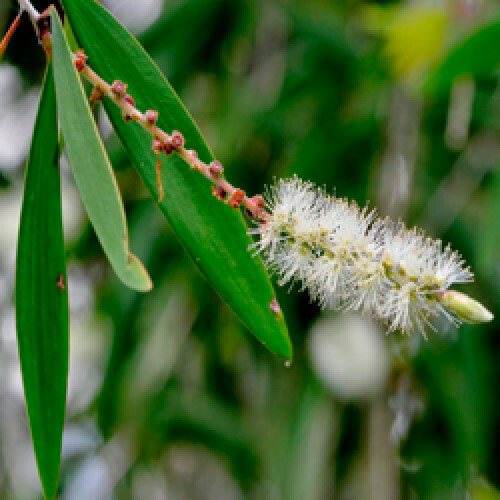 History: Cajeput being the Indonesian for white wood, it is part of the Melaleuca family and used much in the same way as its cousin, Tea Tree. The essential oil has been part of traditional medicine since ancient times, and is an ingredient in liniments such as Tiger Balm.